Live rabbit from a hat. Dove magic - 4 birds. Five the Magician's show is something like you'd see on T.V. only up close and personal at your event. -The most iconic trick becomes a reality. - live rabbit from a hat. -The kids have many opportunities to be part of the magic. We just had Five The Magician perform at my son's third birthday party this afternoon and he did not disappoint. He was professional, punctual, and most importantly, entertaining for both the kids and a room full of adults. The balloon animals and bunny feeding were a nice touch, too. Thank you, Five, for making our party extra special. Five the Magician performed at my daughter's fourth birthday party today, and he was awesome! She was shy at first, but by the end, she and all her friends, and the adults too, were laughing and paying rapt attention. He really helped make today special for her. Thanks to Five the Magician, our daughter and her friends had an amazing time at her 6th birthday party this past weekend. 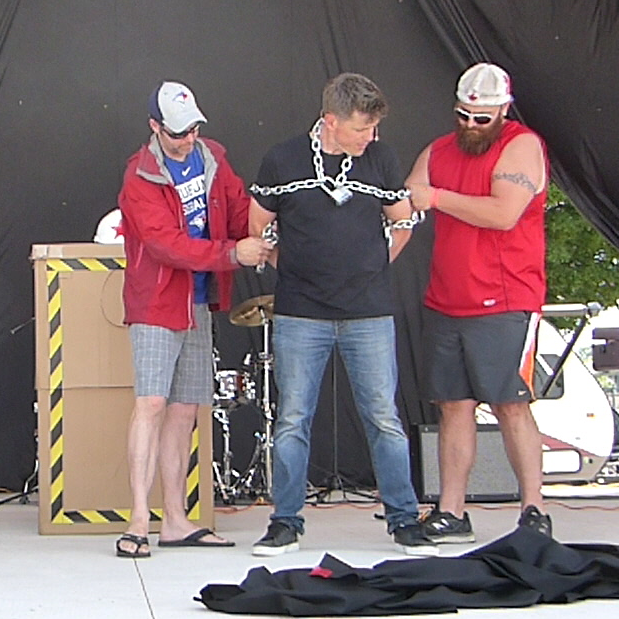 We had Five The Magician come in to do a company holiday show for 83 some children, ages up to 13 years old. Everyone was entertained, even the adults. Highly recommend! Five the Magician kept 21 kids ages 3-6 fully engaged and amazed for his hour long show! The adults were just as entertained! He is great with kids and they absolutely loved it. Thanks for the great show! Was worried that it would be hard to keep the engagement of 12 5 year old boys - but Five the Magician did it in spades! They loved it! Prompt responses, showed up on time, amazing tricks and was great with the kids. Five the Magician was an absolute joy to have perform in our home for our son and his friends. The children laughed and clapped and giggled and so did the adults. We would absolutely recommend booking Five for any events! It was wonderful! Five was absolutely a fabulous performer, his show is entertaining for any age. Very funny!! Kids has a great time, would 100% recommend and hire again. 5 had the kids captivated the whole time he was there. They all had a great time, and lots of laugh. I would hire him again in a heartbeat. Parents, you won't be disappointed. We booked Five the Magician for our daughter's 6th birthday party. All the kids (and adults) were laughing, engaged, and very impressed with all the magic tricks. Five the Magician put on a great show! Highly recommended! Five The Magician is Amazing! 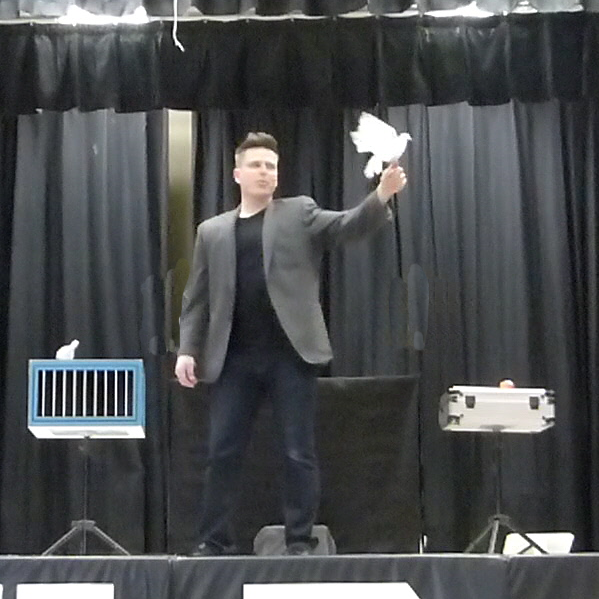 We had Five the Magician for our Linwood Snofest event on February 3/18 and he was a HUGE hit! His 45-minute show, consisting of live birds and a rabbit, was amazing! His quirky sense of humor and awesome magic tricks were a hit with all of the kids and adults who attended. I would highly recommend him. The kids were hooked! Five The Magician is extremely talented. Highly recommended! 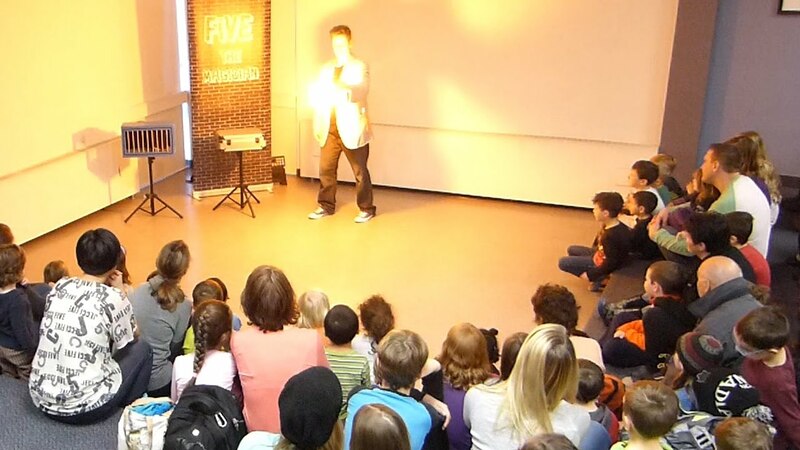 The Most Talked About Magic Show in Baden! Thank you Five for making such a Magical 5th Birthday for our Son! The kids are still talking about the party and even practicing their magic tricks! Watching how you kept 10 kiddos so engaged in your show was absolutely amazing. The moment we saw you at Boston Pizza, we just knew we had to book you for an event. What better way then having Five the Magician at your sons 5th Birthday....a truly fitting event! 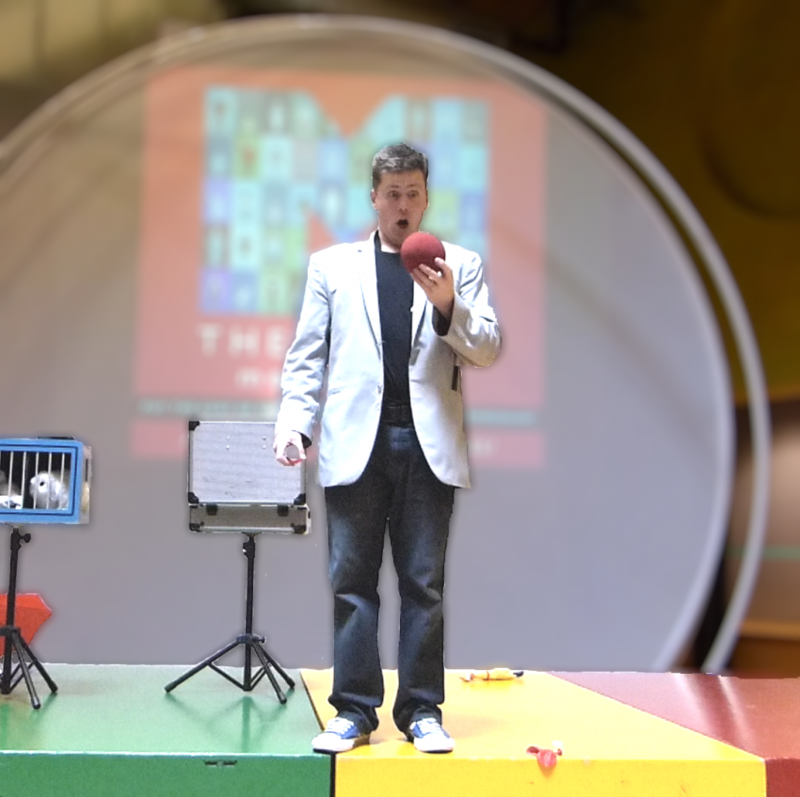 Five the Magician: you are a fantastic performer, entertainer and magician. I was so happy to have had the pleasure of watching you bring smiles and excitement to all the young children at my daughter's birthday party. You captivated our attention and kept things interactive so that the audience was always engaged - a hard feat with a bunch of 3-6 year olds :-) You reminded me of the importance of not taking life too seriously and the magic of a good full-bellied laugh!! Thank you for your time and professionalism - I can't wait to book you for another party. Great show - my students loved it! Five came to put on a show for a group of special education classes. He had a great rapport with the students, kept their attention and everyone was entertained. We are hoping to make this an annual field trip for our classes. Fantastic fun! Five gave a wonderful show to an audience of 8 special needs classes! The students and their teachers thought he was amazing! Many high fives for Five! Five the Magician was excellent in every way. His magic tricks were great and his presentation hilarious and entertaining. His performance was very enjoyable for the children as well as the adults. 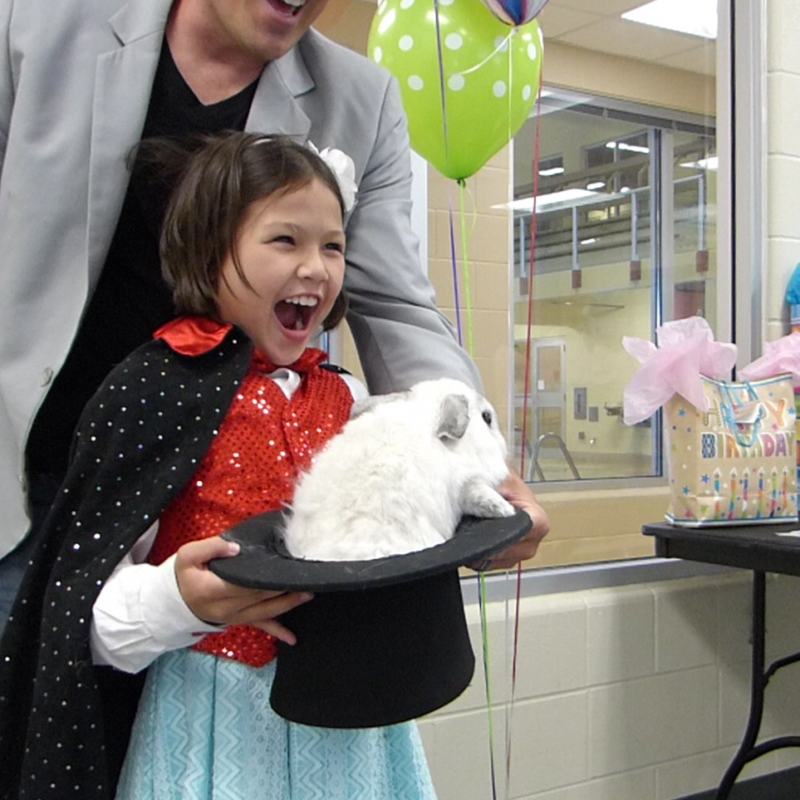 About an hour of show with all sorts of magic that had great reactions from the kids, a couple amazing individual magic tricks with the birthday boy (rabbit in a hat and ball trick), got another child up to do an individual trick with her. After the show he made EVERY child a custom balloon of their choosing and even made a couple extra due to some of the children popping them before he left. To our surprise, we even got some pictures emailed to us today with one of them signed for the birthday boy. Would definitely (already have) recommend him for anyone thinking of having a magician for any type of event. Thank you very much for making our son's 6th birthday party a memorable one. He has not stopped talking to family and friends to let them know all the details of it and how he was a magician for a day and pulled a rabbit out of a hat. 20+ children will be talking about this party at school for quite a while i am sure. Had Five the Magician over for my 8 year old son and 14 of his classmates, Five the Magician was excellent, the kids were entertained, captivated and amazed. Overheard some of them even stating that it was the best magic show they had ever seen. Well done and thank you Five and Big Smiles! Five the Magician kept 15 young girls (and several adults!) engaged for a whole hour, providing them with plenty of laughs, gasps, and an amazing time. We all had a great time and would highly recommend Big Smiles Co. and Five the Magician to anybody! What an amazing, fun experience. adults and children all had a wonderful joyful time. totally worth it!! would recommend to anyone! Five the Magician performed a great show. The kids loved him,so did the adults.Great tricks,funny guy. At the end the kids got the chance to pet the doves and bunny. High 5,Five!Thanks to Ryan,the booking agent,too! Kids really enjoyed the magic show and laughed a lot. Expect the animal balloon to be better. Thank you for the review. And thanks to your daughter for making the rabbit come out of the hat! The kids usually love the wearable jumbo balloon arms, your feedback tells me to give choices for the jumbo balloon. As for the one-balloon sculptures, I can make over 20 different sculptures, but I couldn't make a squirrel. I just wanted to be able to give your daughter what she wanted so I tried. I will now certainly learn the right way to make a squirrel. Thanks again! We hired Five for our daughter's 6th birthday party, at which we had 6 young children, a few teens and about 8 adults. The kids absolutely loved the show, and Five did an awesome job at interacting with them. They loved that they could make noise, they laughed, and they were completely fascinated with the magic. The live animals were a huge hit, especially for the small kids. Five really did a good job at including the Birthday Girl in his performance, and involving members of the audience in his show. After the party, many of the adults who were in attendance commented on the quality of the show and how impressed they were. I would absolutely consider hiring Five for another event! Five the Magician performed at my daughters 6th birthday party. All of the kids loved the performance. Highly recommended.